September 1999: A nuclear waste dump on the lunar surface unexpectedly detonates, blasting the moon out of Earth’s orbit and taking the inhabitants of Moonbase Alpha on an unbelievable voyage of discovery and adventure. Under the command of John Koenig (Martin Landau), the Alphans hurtle through the stars, encountering fantastic worlds and beings in a universe where peril awaits at every turn. Together, Koenig and the Alphans face the ultimate challenge in the farthest reaches of space: survive…and find home. 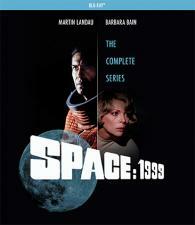 Also starring Barbara Bain as Dr. Helena Russell, Barry Morse as Victor Bergman, and Catherine Schell as Maya, Space: 1999 is a true classic of science fiction television, presented here in a deluxe box set with a galaxy’s worth of special features that fans and newcomers alike will treasure. Strap yourselves in — the journey of a lifetime is about to begin! 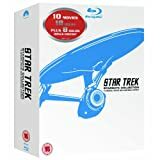 Specs:13 Disc Set, A limited edition snow globe featuring an Eagle Transporter landing on the Moon, available exclusively at shoutfactory.com.